The Lady Okie: Hi. I'm Uncomfortable. 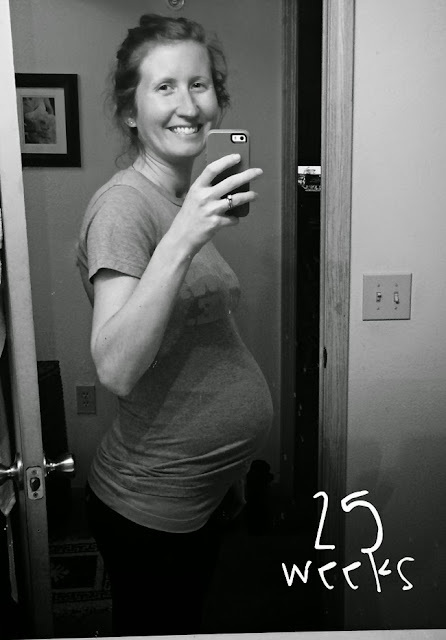 I've been gestating now for almost 26 weeks. Side note: can we all agree that the word gestating is super weird? The book tells me that my uterus is officially the size of a soccer ball. A SOCCER BALL. Take a minute and let that sink in. Something hard and round and the size of a soccer ball is inside of me, which explains why I feel the urge to pee almost as soon as I get back from the bathroom. Speaking of pee, that's what I do now involuntarily every time I sneeze. You can go ahead and add that to The List of Things They Don't Tell You. You're welcome. Yes, babies are a miracle, and I'm thankful and all that. I'm not complaining. Please don't misinterpret. But I'm also not going to lie to you and say being pregnant is as much fun as a day at Six Flags. These people who say they love being pregnant? They're probably also the same people who get pregnancy cravings for non-food substances like Clorox and gasoline. It's a real thing. Google said so. Anyway, back to my hashtag pregnancy problems. For the past week I have had nearly constant rib pain. This is supposedly normal, but oh man is it uncomfortable. You know that crampy feeling you get in your torso when you've been slouching too much? Sitting up straight usually helps and it's gone in a few minutes. Okay, well it's like that but much worse, and it doesn't go away no matter what you do. It's especially bad after eating. A few people have told me that eating a bunch of smaller meals throughout the day should help, but I keep forgetting that helpful advice until after I've eaten a normal serving of food. Instant regret. My stomach feels so stretched that I'm legitimately (although I realize irrationally) concerned that my skin will just rip and pop open. In which case, stretch marks would be the least of my worries. There's also the peeing. Every. Single. Night. Then there's the running. Or, should I say lack of running. Because remember that soccer ball? Yeah. Well it turns out, it's not really all that fun to jog while carrying a soccer ball inside you. The other day I ran/walked 1.5 miles in 20 minutes, and you would have thought I'd just finished running 10 miles. And have I mentioned the peeing? Nevermind, I don't want to talk about it. Luckily, I only have 15 weeks to go! Oh wait. Did I say luckily? THAT'S SO LONG FROM NOW. Except it's actually not, because we have to pack our apartment and move to our house and paint rooms and buy a fridge and probably some diapers. We also need to mow our yard. And by we, I mean Jordan. Specifically the back yard needs help, because with all the rain we've been having lately, we could perform a scene from the Jungle Book back there. I take some comfort in the fact that I have a new maxi dress to wear all summer and that my green pre-pregnancy pants still fit. They're not buttoned, obviously, but I can at least pull them over my thighs and partially-close the button with a hair tie. We'll see how long they last. I'm not paying money for new pants if I don't have to. Now if you'll excuse me, I'm off to the bathroom. It only gets worse. haha Sorry, couldn't resist. I hated being pregnant and just like you I used to get annoyed when people said they loved it. It is so worth it and you will forget about all this as soon as you hold your little girl. Good luck! Your maternity dress looks great! Sounds like you will be keeping pretty busy! My sister had the same pain.. She said no matter what she did her baby wouldn't move from that spot.. comfy ribs, maybe? I'm sorry that you're hurting! (and peeing and not running) Not helpful but this reminds me of a really cool time-lapse graphic I saw, showing how a woman's internal organs shift during pregnancy. A little scary! And you can really see how the baby is basically sitting on that bladder. If it's any consolation, you look great! I love your pregnancy fashion! You look super cute in your outfits! I also resist buying new clothes even if necessary which has led to outfits where I wear capri pants with my boots socks and boots and hope it works, which it did not and was a disaster I finally accepted I needed a new pair of regular jeans! I would wear that dress if I were pregnant; it's cute! You could even wear it home from the hospital if it's comfortable. I'm one of those weirdos that likes being pregnant. :) (But no cravings for Clorox or gasoline ... that must be another brand of human!) You look great though and the day will be here sooner than you know! Of course I had to google the size of a non-pregnant uterus (orange; if anyone else is wondering) and that has thrown my sidebar ads completely out of whack. Also, I love moving. It's one of my favorite pastimes. I'm the oddball that offers to help friends pack up and relocate around town. Churches should have maternity closets that women can donate to and borrow from. Free to donate; charge a one-time fee to anyone who wants to make use of it and have that money go to an organization the church supports. Hilarious! I didn't even think to see what a normal-sized uterus was. An orange is definitely quite smaller than a soccer ball. (And LOL to it messing up your sidebar ads.) I actually am kind of excited to move and dig stuff out of the corners and get rid of crap we don't need. But packing up the kitchen suuuuucks big time. All those breakables, and even though I don't feel like we have that many cabinets, it seems like they never end. That's a great idea about the maternity closet. It really does stink to have to buy clothes that you know you'll only wear for a short time. That's similar to how I feel about buying new baby clothes. They grow out of them so fast! It all seems wasteful to me, but when you put on a shirt that doesn't cover your stomach, it really is necessary to buy a new one. well this sounds terrifying and not fun AT ALL. gestating is a super weird word. i don't dig it. at least you look fabulous? oh my gawd - I love love love this post! I think you have been reading my mind! People who are like "You are glowing!" I want to hit them and say, "yea, I am glowing because I am so hot from the humidity...it's only May and I already have sweat dripping down my legs" Preach on sista! ha! It's so true. Jordan makes fun of me because when I try to roll over and get out of bed, I'm like grunting and shaking everything. Good grief. It is fun, though. And weird. Crazy the way our bodies shift to accommodate a baby! Yikes. I desperately want a child someday, but these honest thoughts scare me just a bit...haha! Regardless, you still look adorable, so there's that. ha! well thank you :) It's not quite as terrifying as I described... I do tend to be dramatic. But then again, I'm really not exaggerating about the peeing. It's kind of insane. First: you are a super cute pregnant lady. Second: it gets better! I swear! Not lying. I would say "Keep going! You're almost there!" but then you would hate me, just like I hate people who yell this when there's still 7km between me and the finish line. That reminds me of one of the best signs I ever saw during a race. It was a half marathon, and someone was standing at mile 1 with a sign reading "You are NOT almost there." It totally cracked me up. I can't imagining giving up big meals. I'd probably resent the kid inside me for taking food away from me. Considering you said no one warned you about peeing every time you sneezed, I'm just warning you that that still happens after you give birth too. Or if you decide to jump on a trampoline. I learned that one the hard way. ha! so, now that I've mentioned the sneezing thing, multiple people have told me that continues to happen after. I guess even the human body that can do all sorts of amazing things can't figure that one out ;) good note about the trampoline, though. I hadn't thought of that... people said it happens while running too. Ahhh! You're so cute!!! I know you're uncomfortable and being a super cute pregnant lady was not the point of this post, but I only state the facts. Keep up the great work growing that baby!! You've got this! Thanks, Amy! It's not all that bad all the time. I love feeling her kicking :) I do enjoy being dramatic, though. haha. I actually think I might be dressing cuter NOW that I ever did before Baby Bum. Who knew? Ugh to being uncomfortable- I'm sure it's just so STRANGE to finally be experiencing all the symptoms/things that friends and family have told you about. I can be like yeah, yeah I've heard that- but until it's YOU it probably doesn't really sink in. In other news? You and your bump and seriously adorable. Want to know what's really strange? Putting on shirts that you owned before getting pregnant that you only wore for sleeping because they were really big, only to discover that they are nearly TOO SMALL. Wut. You are so cuuuute! I think baby bum is making you even funnier, as impossible as it seems. Love hearing real stories about pregnancy, instead of all the "I'm glowing" lies. Ah your outfits are so cute! 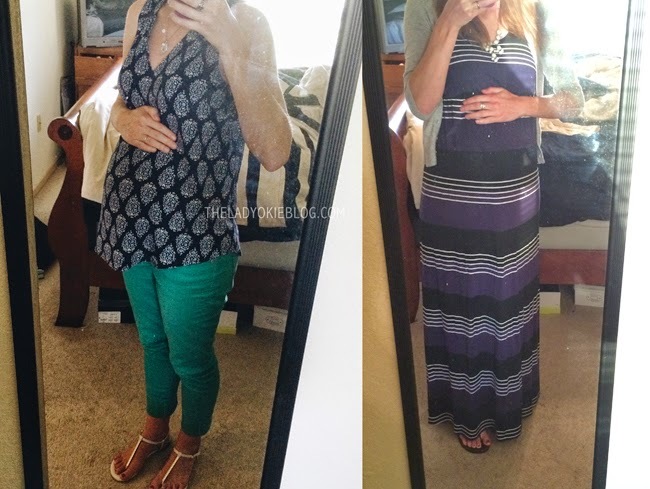 I totally tried to avoid spending money on maternity clothes. If it's not on clearance, mega sale, the goodwill rack or somewhere in walmart... I don't buy it. Same goes for kids' clothes, haha. And yes to the peeing thing... I used to have a bladder of steel and could hold it for hours... now I just can't trust it! Aaanyway, sorry about all the discomfort right now! Peeing all the time definitely does not sound like fun! Thank you for being honest. My non-stop peeing came in full force this week- man oh man! And probably some diapers...girl, you crack me up! I'm sorry you are so uncomfortable. I really don't even want to imagine a soccer ball size uterus! But you do have a super cute baby bump so there's that. I like how you tagged this "dramatic" lolol. As a 38 weeker, I'm keepin my trap shut. But yeah, so much urination. How. hahah I love this whole post. Please keep the list of "things they don't tell you" coming because I need to know what I am in for when I bring a child into this world :) haha but for reals, you're hilarious! Now that I'm done LOL at "gestating," let me go read the rest of your post. Seriously, that word. Ahahaha. I remember this all SO WELL. I will say this, the first time you bend over to pick something up after giving birth is amazing. The ability to do common things like bend over and get out of bed without crying and heaving and bodyslamming the bed is incredible. Every time I drop something, my knee-jerk reaction is to cry until I remember that it's no big deal to bend down and grab it. It's like I re-discovered my life. The rib pain was AWFUL. I was right about 25/26 weeks too when it really started bothering me, but mine actually went away after about a month. I have no idea why, but I remember noticing that it was totally gone. Your new maxi dress is cute! I've heard about the constant peeing from several pregnant people, and that makes me scared for if we ever decide to have kids, because I already have a small/anxious bladder and am in the bathroom all the time. Haha, the idea of a soccer ball is rather horrifying, isn't it? I hear you on the rib pain, although I seem to battle hip pain more than anything else, thanks to my modified sleeping positions. Ahh, a soccer ball! You look super super cute in that maxi dress! Love it. I also really love your honesty and your request for people to only say nice things or nothing at all. I'm at that point in my life where my patience with people and their always wanting to one-up with every comment is running thin. I don't even know if that sentence made sense, but I think you know what I mean. Ha. Super jealous your pre-preggo pants still fit you. I gave up on that weeks ago! You and your soccer ball are adorable and I'm feeling you with the rib pain. But you're really cute being uncomfortable...and really , isn't that all that matters?! I've gotta hand it to you for keeping it real. You make pregnancy sound as appealing as a dentist appointment and my baby fever is nowhere in sight (don't worry my non-existent baby fever is not only thanks to you but largely thanks to my job).